Details: The machine adopts inbuilt direct drive servo motor, it is possessed with excellent steering charecteristics and energy-saving features, greatly increased the working efficiency, and reduced the operating cost. Applicable to knit wear, under wear T-shirt, for light and medium materials. 1) This machine is used for seaming and enforcing two cloth such as under ware etc, suitable for light material. 2) The stitch number is #607, but actually it equip 5 needle, the first left needle is without any thread, which is used for loosen the looper thread, avoid the shrinking of the materials. 3) Needle bar transmission structure, adopt all-sealed in, more safe and easier to keep clean. 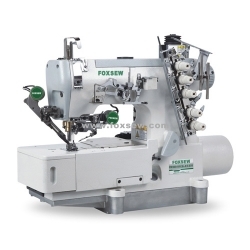 4) Complete automatic supply system and oil-filter device, ensure the max sewing speed to be 6000r.p.m. 5) Some key parts are imported from Japan, which enhance he wear-resistance of the machine. 6)the extra wide stitch length of LS31016-01CBTD is hanged from 4.5mm into 5.0mmremark: can be equipped with the direct drive equipment. please equipped the rear puller, when sewing the blanket and super heavy materials. maximum speed at 4500 R.P.M for the big gauge, maximum speed at 5000 R.P.M for the heavy materials.